Here's my submission for the Valentine's Day modding contest on the Winter Brawl Modding Discord server! 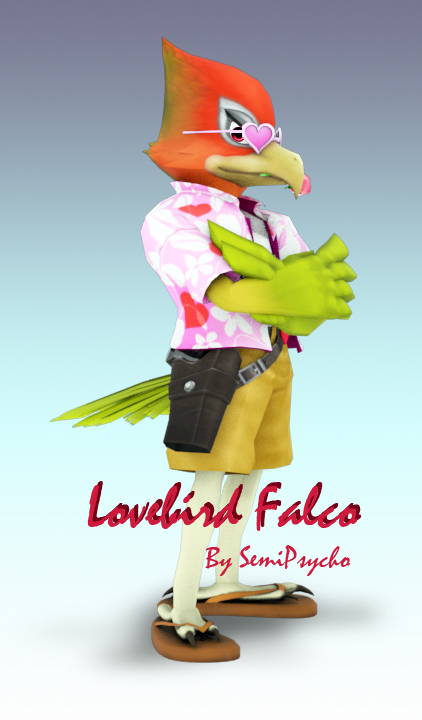 This skin takes inspiration from an actual peach-faced lovebird, and since it's a tropical animal, I complimented the skin with tropical and valentine themed attire! Canonically Falco has robotic legs, so I gave him prosthetic zyogactyl bird feet! Falcons don't have those kind of feet, lovebirds do, but its better than being bird without bird feet! He constantly wields a stick that appears to be similar to Lucas's, except colored like Porky himself (not supposed to happen)! Also, he has a hidden special effects machine on every map to \"prove\" to everybody he has PSI abilities like the popular kids! This is the very first character in which I have rigged. I will admit it is not very high quality, and I hope you don't expect my first model import to be awesome (unless you think its awesome :D). There are a few glitchy spots, like his feet. And for some odd reason, the stick is constantly being held and has distorted textures. However, from afar he looks pretty good. Its just when you pause and on the results screen you can see faults. You can go in and delete the objects for the stick altogether if you'd prefer that. A loop of Your Sunset from TTT2. It does not loop to the beginning of the song. I intended this song not as battle music, but to play while looking the the album/sticker album/ replay section. I haven't uploaded anything for awhile. I just recently fixed (and re-softmodded) my Wii so I may be producing more hacks. This is just a .brstm I made, and decided to might as well post it here. Also, I'm sorry I did not upload it to Dropbox. I didn't know that it was now the preferred website, but I'll definitely upload future hacks to Dropbox from now on. A hack I made that replaced the Menu SFX with the ones in Excitebots Trick Racing. This hack contains a .sawnd file. To insert this .sawnd, open Sawndz and have your smashbros_sound.brsar in the same file destination as Sawndz. In the bottom where it says Insert Hex Packet or Sawnd, type "7" where it says Group ID, then click insert and choose the .sawnd that you downloaded, then wait for it to finish. After you finish, put the smashbros_sound.brsar in the sound folder. Play. Simple hack I made for a friend at TGC. The sight used while aiming with a Dragoon is now replaced with a troll face, as it should be!!! Trololololololololol!!!!! Time Splitters: Future Perfect. This hack goes over Menu 1 (X02) or in any other menu soundtrack. This soundtrack does loop. Obviously since it is a menu sound hack it does not desync wifi. Pretty basic hack texture. I simply made recolors for all the Yoshi colors excluding the green one, because it is the original. I'm hoping that this isn't just scrolled passed too often. Technically this is my first hack, which should be basic, but I'm fixing a model to rig over some character and make a custom moveset for that character, which is the Deer Haunter from Time Splitters Future Perfect, if you know that series. Anyway, please tell me if anything's wrong with it so I can fix it. BTW, I do not know if the .pcs files included in my download is required to add. I just put them in just in case. Page created in 0.162 seconds with 52 queries.